This week Jules of Someone’s in the Kitchen chose Flaky Turnovers for TWD. My husband refused to call them “turnovers,” referring to them as “handpies” instead. Whatever you want to call them, these little fruit-filled sour cream pastries are good! Like pie, but so much easier…super versatile, too…fill them with whatever fruit you fancy. I actually made these back in August, when this month’s recipes were first announced. We were still in prime summer produce season then, so I used peaches and blueberries in mine (yum!). Instead of making turnovers shaped like half-moons, I did triangles (no scrap!). Normally I like my pastry to be a bit more golden brown on top, but I refused to make eggwash for just two turnovers (lazy! ), so they got the powdered sugar disguise (really lazy!). I made a half recipe, and got four turnovers…two of them were baked right away for immediate gratification, and two went into the freezer for a busy day. I had that busy day, and am happy to report that they worked really well baked just out of the freezer, keeping their shape nicely with no leakage. For the recipe, see Baking: From My Home to Yours by Dorie Greenspan, or read Someone’s in the Kitchen. Don’t forget to check out the TWD Blogroll! i have not had breakfast yet – looks great! You are always the first one to come in with a TWD. I applaud your dedication!!! These turnovers are indeed scrumptious!!! Hm…. I’m really liking the triangle versions I’m seeing… I had scraps galore. And re-rolled… and re-rolled. 🙂 The filling sounds fantastic! They look wonderful – I have another batch of dough in the fridge I liked them so much (as did others). Glad you got a chance to make the earlier and use some fresh fillings! Girl, you have some good ideas. Triangles to avoid waste? Genious! I had trouble with leaking so maybe I should try freezing my next batch first. “Handpies” makes me think your husband might be from the South, right? Oh yours are perfect. Mine are ugly. Love your triangles. YUM!! Your turnovers look incredible!! I’m loving your blueberry peach combo!!! Love your fruit choices! They look delicious with just a little powdered sugar – simple and divine. These look delicious. I like the idea of putting them in the freezer for a busy day. This recipe was really really good. Yours look so good and I love your choice of fruits! These look divine! The triangle shape is the way to go on these…they look amazing! Ooooh! I did square on the second round. I hate waste. Glad you enjoyed these! And thanks for baking with me! I did 1/4 recipe for just 2 turnovers. I made the eggwash then immediately felt extremely wasteful and silly. A powered sugar disguise is really the better option 😉 Beautiful! These look wonderful. Peach and blueberries sound perfect. 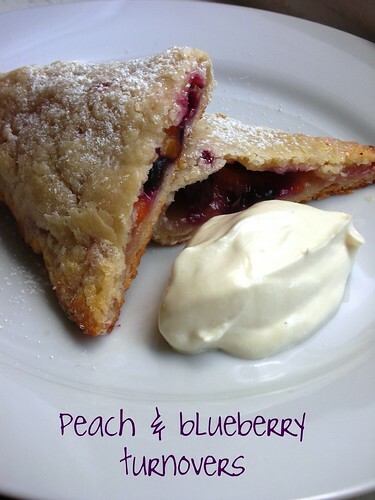 I made a few blueberry turnovers and they were delicious. Oh I love blueberries! Your tarts look amazing. I might add blueberries to my apple tarts next time. Love the cream cheese pastry. Whatever you call these, yum! Gorgeous! And yes, perfectly seasonal for when you made them 🙂 I didn’t use an egg wash either, but I always default to cream or milk on top. They still brown up quite nicely that way. Love the blueberry and peach combo. Very nice. Mine did not turn out as well as I had hoped they would. Yours look very tasty. Great job!! Those look great, I’ll have to make them soon! How nice !!! I wish I had thought of freezing some !! Peaches and blueberries – delicious!! How do you get everything you do to come out so perfectly! I am impressed week in and week out! Your turnovers look great. I like the peach-blueberry combo. Oh gosh, I really need to make some turnovers now; I’ve been seeing so many awesome ones. These look fabulous!